I’ve been wanting to pop by Petit when they first opened a few months back but never got to doing so since I normally go to their main outlet in SS17. Last Saturday, I was too lazy to go that far so I decided on Petit for lunch with Jeen. 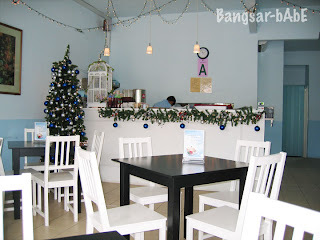 When we arrived at 1.30pm, it quite empty; only 2 tables were occupied. I checked with the waiter whether the mille crepe was available. It’s best to make sure they have the mille crepe as they tend to run out of it quite fast. Jeen had the Pan Fried Fish with Pepper Marmalade. The fish was flaky and sweet. 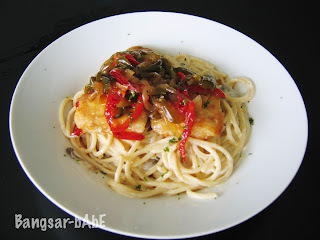 The marmalade sauce with caramelised peppers complimented the fish nicely. However. the pasta that came with the fish was way too creamy. We felt ‘jelak’ after a few mouthfuls. They should have gone easy with the cream. 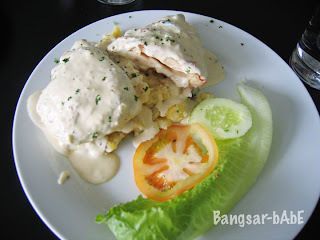 My Chicken Cordon Bleu was a disaster. A far cry from the one at Food Foundry SS17. This one was overcooked causing it to be hard, chewy and dry. I couldn’t really find any cheese inside the chicken. Again, the cream sauce was too rich making it cloying. The mash potatoes were standard. Their saving grace was the mille crepe. We ordered a slice to share. This one has quality control as they brought it from the main branch itself. 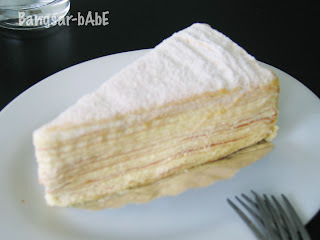 Layers of delicate crepes sandwiching fresh cream custard…every bite was sheer bliss. Apart from the heavenly crepes, I was quite disappointed with the food and service. Even though there were only 2 tables occupied, the waiter forgot about my order until I queried him after more than half an hour of waiting. They have to brush up on their service and food quality or face losing potential customers. In short, I would stick to Food Foundry SS17 from now on but wouldn’t mind coming here just for the crepes…that’s if they have them in stock.